Animation Tips & Tricks: Could You Provide Some Tips on Staging and Composition? Could You Provide Some Tips on Staging and Composition? I learned some great tips from my former teacher Shawn Jeffery at Sheridan College. We would analyze the layout of masterpieces like Mulan, and talk about staging and composition. He told us the importance of staging a scene as not to distract the viewer from the story being told. Layout artists do this by combining foreground, mid-ground and background objects and letting perspective and depth cues lead the eye towards the focal point in the shot. He taught us about screen axis, the invisible line that keeps characters on opposing sides of one another during a scene to avoid confusion. And when to break the axis line, like in a fight scene or dramatic moment when you want the audience off balance. These tools are important for all storytellers but often animators don't think about. But animators DO need to understand how to compose and stage shots because the characters themselves should be positioned properly. Obviously when you are working in a studio and get a shot from layout much of this has been worked out, but it still can be improved on (sometimes greatly) with some simple rules. 1. Always mind the format of the project you are working on, letterbox, 4:3, etc. Try to work with the action and title cut off marks on screen so not much important stuff happens outside of these regions. 2. Avoid staging characters straight front or sideways, have your character angled in more in 3/4 for more depth and appeal. 3. Avoid cutting off character with the camera plane at joints; the ankles, the knees, the neck or the elbows. This avoids a disembodied feel. Always cut off the body in mid shin, leg, upper arm or neck if possible. 4. If there are two characters in a shot, when you position one higher then another they will be more dominant, and vice versa. Even slight shifts really make a difference. The four points -- upper left, upper right, lower left and lower right -- are the best locations to place the element of interest. Having a character dead center or far left or right is difficult for the eye to track. If you place your character (or its face for example) in one of these locations it will enable you to view it naturally. 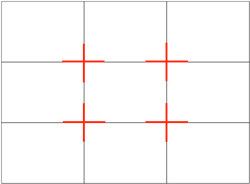 Studies have shown that when viewing images that people's eyes usually go to one of the intersection points most naturally rather than the center of the frame. There are many good books on subject of composition, from photography to film to animation. And you can watch great movies. Most have really good composition you can steal or use as reference for your shot. There are examples for almost every situation out there. Lastly, this isn't really a composition tip, but when animating try not to have much of movement too far away from the shots focus point. For example, if a character is standing and talking in a mid shot, and his face is in the upper right third or the screen, you don't want his hand down by his side making lots of movement taking the viewers attention far from the face, where all the important stuff is going on. Hope that helps a bit! Thanks for this post. We're working through a storyboarding exercise and your post has helped cover some important tips.